• High quality and comfort. • Specifically designed for use in and around the MRI suite. • No effects on magnetic field. • Dual drop down side rails. • High quality locking casters. • 160 kg load capacity. • Produced from non-ferromagnetic high quality materials. • Not effected by magnetic field. • Foldable to a convenient size. • 130 kg weight capacity. • Wireless data transfer between monitor and finger probe. • Monitor can be placed anywhere in MRI room. • Integrated MRI compatible battery in monitor and finger probe. • System is controlled on touch screen. • Adjustable light and voice alarms. • Adult, pediatric, neonatal probe options. • No need for extra accessories. • Can be used with all MRI scanners. • Specifically designed sound control unit for MRI needs. • Integrated speakers in music control unit provide the same sound with the patient in the control room. • Sound levels in MRI room and control room can be adjusted separately. • A push-to-talk microphone is provided to communicate with the patient. • MUTE circuit pauses music when the microphone is active. • The system is suitable for fMRI applications. • PC, DVD player, MP3 player, USB or any other source can be used. • MRI compatibility (up to 3 Tesla) certificate. The T-450 MRI-Projector System is designed to be MR conditional and is manufactured and tested to the highest standards according. The Projector system is designed to be used with all MRI scanners up to 3 Tesla magnetic field strength. Through easy and accessible controls, the MRI projector offers one-way patient video and audio experience with full flexibility. Thanks to advanced projection technology, the projector provides 300-inch image with incredible color contrast even in the bright environment. At the back side of the projector, there are two 20 W speakers which provide incredible sound inside MRI room. Power on and all the futures of the projector are provided by remote control. The projector comes with 7000-hour lamp life. After final positioning of the project inside MRI room, optimum image quality is achieved by sensitive adjustment of focus and zoom using adjustment tools. • All parts in the MRI room are MRI com patible. • Direct connection to monitor or video recorder. • Easy installation and high image quality. • MRI compatibility (up to 3 Tesla) certifi cate. • Convenient, versatile and user-friendly 3D virtual reality system. • Head-mounted display fits completely within the head coil. • Digital audio system with 30 dB noise- attenuating headset. • Compatibility with 3T-rated field strength magnets, ensuring compatibility with all state-of-the art MRIs. • MRI compatible up to 3 Tesla. • ECG recording which is based on the MR technology. • Analog and digital outputs. • Mains and battery power supply. • Optical measurement of core and skin temperature option. • Control unit option to observe the data and control the system from technician room. • Capno option for state-of-the-art gas analysis during anaesthesia. • Integrated magnetic field detector. • Visual and audible alarms. • Saves and displays the most recent NIBP values measured. • Display of patient values on large colour screen, visible from across the room. • Operates at up to 400 Gauss (40mT). • Stand-by mode for instant restarting. • Standard external USB printer to document each examination. The MORPHEUS LT MRI is an anesthesia machine and it can be used on adult, children and newborn patients. The MORPHEUS LT MRI is suitable for administration of Oxygen – Air – Nitrous Oxide – Halothane – Enflurane – Isoflurane – Sevoflurane – Desflurane mixtures. • Manual and automatic ventilator options. • CO2 absorber (canister) system. • A fully automatic air ventilation and gas delivery system. • Selektateck or cone type options for vaporizer device. • Works with a xenon lamp. • Specifically developed for MRI environments with non-magnetic materials. • 10 lt O2 capacity. • Not affected by the magnetic field. • 5 lt O2 capacity. • 2 lt O2 capacity. • Comes with 50 PSI preset diaphram regulator & 0-15 LPM flowmeter. • Runs off any 50 PSI oxygen source. • No electricity or batteries needed to operate. 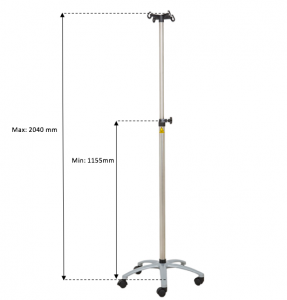 • Produces 0-350 mm Hg of suction & flowrate of 21 LPM. • High impact resistant collection canister. • Collection canister has built in hydrophobic filter which eliminates contamination. • Dual 50 PSI check valved outlets allow use of suction and oxygen simultaneously. • Great for patient transport or attaching onto crash carts. • Specially produced for MRI. Produced by non-magnetic ceramic material. Can be used anywhere in MRI room. • Can be hung in or out of MRI room. High sensitivity, non-chilling contact diaphragm. Specifically developed for MRI environments. • All parts in the MRI room are %100 MRI safe. • Response button can be used for all audio and visual paradigms. • Various response button design options for specific requirements. • Sync box provides the synchronization between MRI scanner and FMRI software. It can be used with all FMRI applications and all MRI scanners. Data logging rate: Data logging rate can be adjusted by user from one point every second to one point per hour period.